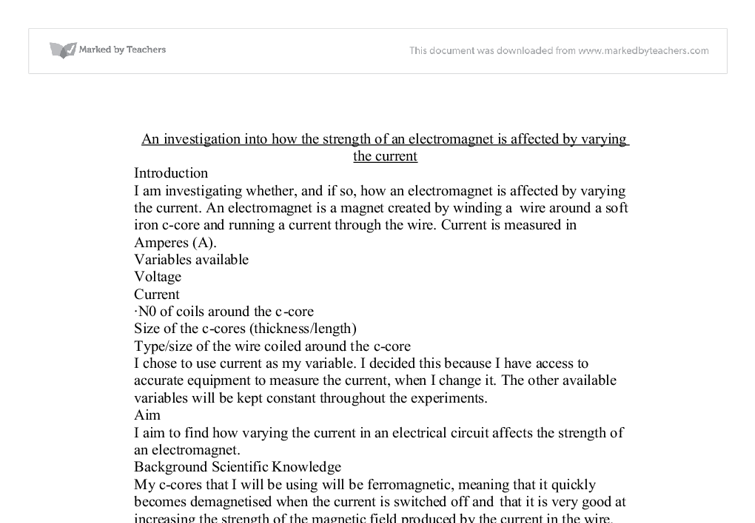 I am investigating whether, and if so, how an electromagnet is affected by varying the current. An electromagnet is a magnet created by winding a wire around a soft iron c-core and running a current through the wire. Current is measured in Amperes (A). I chose to use current as my variable. I decided this because I have access to accurate equipment to measure the current, when I change it. The other available variables will be kept constant throughout the experiments. I aim to find how varying the current in an electrical circuit affects the strength of an electromagnet. 1)I will set up the apparatus as shown in the diagram below. 2)Set the current at the right amount of amps. 3)Use newtonmeter to pull c-core from magnetised c-core (slowly). 4)Record the force (N) and minus the weight of the c-core. I am going to test how many Newtons it takes to pull the metal away from the electromagnet, with different currents. I will have to subtract the force due to gravity that the C-core has. This is because I will be pulling the c-core, from the electromagnet, vertically. It will give me the true reading of how many Newtons it actually took to pull the objects apart. the heat of the variable resistor affected the results. My anomalous result could have been due to the variable resistor being cold, during the first experiment, when all of the equipment was cold. I would also like some extra time to do some proper research into the findings of the first people to test this investigation. It would also be interesting and useful to discover what they found. The nearer the thermometer is to the centre of the block the faster the heat will be transferred, and the greater the change in temperature readings. This will mean that the overall result for the specific heat capacity will be less. This may make my results nearer the book values. -Heat from other sources can easily affect the experiment because they can affect the current and therefore the voltage any place in the contacts like the wires and the multi-meter. To combat this problem, the experiment was conducted in room temperature, which means that there would not have been any significant changes at room temperatures. The experiment didn't turn out very well and I was delayed somewhat because I thought I had used a faulty lab pack. 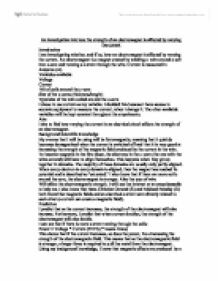 The fault however, lay in my set-up as I had taken the power from the alternating current where a magnetic experiment of this type requires a direct current supply. To calculate the viscosity a graph will be plotted using the graph stated above and sum rearrangement (shown below) you will see how the viscosity can be calculated from the gradient. The mass of the ball bearings can be calculated by multiplying the density by he volume so put into the equation makes it become ?r3?steelg=6?r?v+ ?r3?syrupg. * I will handle all electrical equipment with dry hands to prevent electrical shocks. * Tuck stools in to prevent no-one falling in the lab. * Put all bags under the table to prevent no-one falling in the lab. * Never run in the lab. The electrons flow from the negative terminal to the positive terminal. The Ammeter measures the current (in amps) flowing through the component. The ammeter must be placed in series. It can be put anywhere in the main series circuit, but never in parallel like the voltmeter. The other 99% is wasted in the supply chain. Using conventional fossil fuelled generating plant, losses accumulate as follows: * 10% of the energy content of the fuel is lost in combustion and only 90% of the calorific content is transferred to the steam.